Cataract surgery with a lens implant and the closely related techniques of refractive lens exchange or ‘PRELEX’ are some of the commonest forms of surgery.Most people having such surgery need reading glasses although they may not require glasses for distance vision. Now we can offer you a procedure which involves placing a very thin additional lens implant just in front of the standard lens implant. This new lens implant is the Sulcoflex Trifocal Lens which brings into focus the images of things closer to you e.g. a computer screen, a book, a newspaper, or a menu. If you also have a focussing error for distance, the Sulcoflex lens can be selected to also take account of this. The Sulcoflex trifocal lens can also be a great option for those patients who may have already undergone cataract surgery under the NHS or privately and for whom multifocal lenses were not previously an option. Some patients can choose to have multifocal type lens implants at the same time as their initial cataract surgery or refractive lens exchange procedure. If you are in this group, then the Sulcoflex trifocal is again an option for your needs. 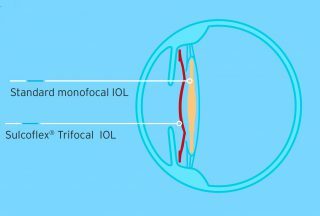 A conventional high quality monofocal lens implant (the primary lens) is selected to replace any cataract which may be present whilst also correcting your focus for distance vision. If necessary this lens can also correct astigmatism. After that, the Sulcoflex trifocal lens is placed in front of the first lens implant giving a flexible, and reversible, approach to providing intermediate and near vision. This is referred to as the DUET procedure. The Sulcoflex trifocal lens and the DUET procedure offer an elegant, flexible, safe and clinically proven procedure, which is also reversible if necessary. Book an appointment with our highly experienced cataract and refractive surgery consultant at Face & Eye, to discuss the options now available to further reduce your dependency on glasses. N.B. 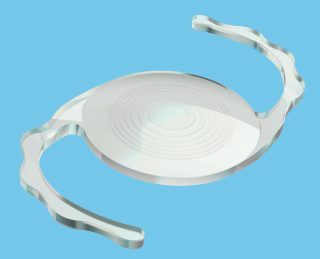 The Sulcoflex Trifocal Lens implant is not available under the NHS.